We at Shadowcatcher Imagery consider sunsets to be our specialty, even quick candids like this get our bag of tricks applied. 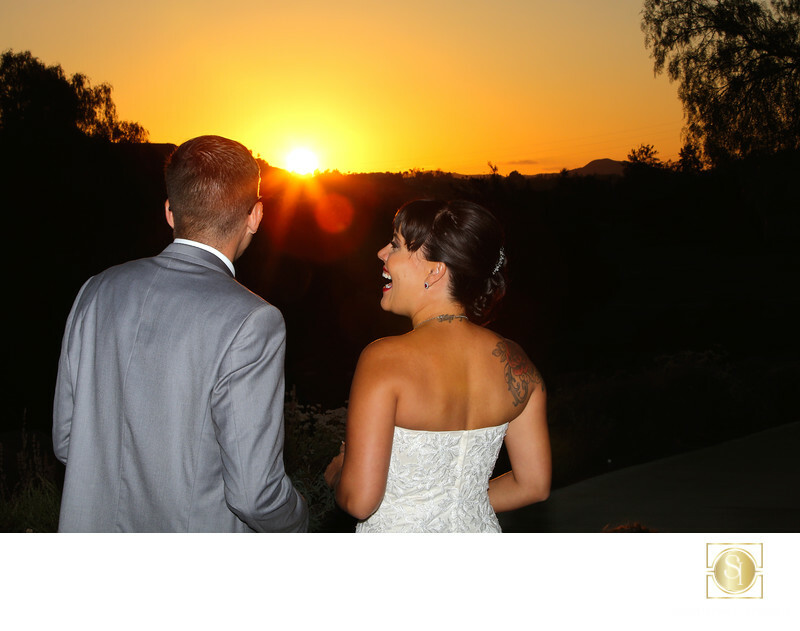 Our couple at Maderas Golf Club in Poway, Ca was just walking down the cart path, admiring the sunset when one of us fired this one off. It's tough to balance flash with the sun shining straight down the barrel of a lens, but it's something we've conquered. Flash is critical, and knowing how to expose for the shadows and highlights makes it possible to get a successful image under difficult lighting conditions. Having the right gear helps, too. Fast lenses that will focus in low contrast situations are absolutely necessary. Then hours of practicing the craft of photography will tie it all together. Shot with a Canon 5D mkIII, Canon 70-200 f2.8L IS and 600 EX-RT.